Bengaluru FC became the first team to the secure their entry into the Indian Super League (ISL) playoffs last week. 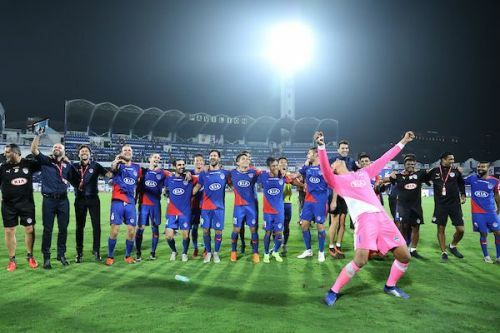 Given their dominance in the first phase of the ISL, it was more or less guaranteed that Bengaluru, coached by Carles Cuadrat, would be involved in the semifinals again. The ISL 2017-18 runners-up have impressed in all departments of the game this season. Their attack, especially, has shown resilience and Bengaluru are no strangers to scoring last-minute goals and staging second-half comebacks. Bengaluru would have ideally wanted to qualify on their terms instead of relying on other results. But they suffered a minor blip in the second phase of the ISL after losing to bottom-half teams Chennaiyin FC and Delhi Dynamos in succession. But they pulled themselves out of misery with a dominating performance over FC Goa. The Blues' spot in the last-4 was, however, confirmed even before that 3-0 win when Jamshedpur FC lost 4-1 to FC Pune City. What's worked for Bengaluru this season which saw them conquer most of the opponents in the 10-team tournament to romp into the semis? We look at 5 things that they executed well this season. The conclusion of the 2017-18 season rang in drastic changes for Bengaluru FC. The biggest of them was, of course, the departure of their coach Albert Roca, who delivered a Federation Cup and Super Cup during his time with the club, apart from seeing them into the AFC Cup final. Apart from the coach, players like John Johnson, Daniel Segovia, Toni Dovale, Victor Perez, Braulio Nobrega and Edu Garcia departed from the club. Indian players who left included Subhasish Bose, Joyner Lourenco, Collin Abranches and Abhra Mondal. Among these, the exits of Johnson, Garcia, Dovale and Bose, in particular, were a huge blow for BFC. The four (Dovale after Garcia's transfer) were part of the core Bengaluru team left behind by Roca. When new coach Carles Cuadrat, Roca's assistant, was roped in, Bengaluru had to address the void immediately as they had an AFC Cup inter-zonal semifinal clash first up against Altyn Asyr of Tajikistan. They took their time but roped in the right people. The retention of defensive midfielder Erik Paartalu, playmaker Dimas Delgado, striker Miku and defender Juanan Gonzalez probably helped. And through the transfer window, players like Xisco Fernandez, Albert Serran and Chencho Gyeltshen joined the ranks and played vital roles in Bengaluru's march to the playoffs. The Bhutanese Ronaldo Gyeltshen was offloaded in the winter transfer window to NEROCA FC and in came Luisma Villa. The recruitments have been spot on and mainly addressed the concerns of the coach. Whether it was the signing of Serran for Johnson or Rino Anto as a full-back with Nishu Kumar filling in the shoes of Bose, Bengaluru built their team around the needs of the coach and not the other way around. The recruitment policy is mostly based on the position and it doesn't matter if the incoming player was an Indian or a foreigner as is seen from Kean Lewis' signing as a winger. With Paartalu ruled out for the rest of the season due to a knee injury, Bengaluru are currently looking to fill that hole before the start of the ISL playoffs. Given their activity in the transfer market, it's sure to be a need-based signing rather than a big-name spend.